Beware! Spoilers for the very end of Avengers: Infinity War to follow. There is not a safe, spoiler-free section of this post. Anthony and Joe Russo, known as the Russo Brothers, directors of Marvel Cinematic Universe films, have a steady hand on the throttle of Avengers: Infinity War during the film's final hour. Slowly, the stakes and tension ramp up until just before the film ends and when Thanos snaps his fingers and achieves his goal of wiping out half the sentient population of the universe, the Russos slam on the gas to barrel through the dissolving demise of some of the MCU’s most popular characters -- tellingly, a lot of heroes with sequels in the pre-production pipeline. It’s a shocking place to end a blockbuster film that the directing brothers and Marvel Studios president Kevin Feige have insisted since 2015 is not half of a story. The movie sequels that it brings to mind are more Empire Strikes Back or Back to the Future Part II, possibly because we don’t have an example of a film that has attempted to accomplish what Infinity War wants to do narratively: draw multiple franchises into a two-parter, or a four-parter (depending on if we’re counting all Avengers movies as part of the arc). At least, we have no cinematic example; what we do have are decades of comic-book crossover history in Marvel Comics. Regardless, Infinity War is still a blockbuster summer film, and follows some storytelling tropes that set the stage for what’s to come, from the next two Marvel films and finally to Avengers 4, which is shaping up to be the real conclusion to the three Phases of the Cinematic Universe. For those who aren't familiar, a huge comic-book-crossover event consists of a core book, usually a limited run, that tells the grandest story with the largest moments and features many characters from other comic books. In between issues of this limited-run series, the other heroes continue to issue their own comic books that tell the stories of the featured characters populating the overstuffed core book. To apply this to the Marvel Cinematic Universe, think about the arc of Tom Holland’s Spider-Man: Introduced in Captain America: Civil War (a Winter Soldier sequel that was also effectively Avengers 2.5), the character got to go off and be his own star in Spider-Man: Homecoming before popping up in Avengers: Infinity War. 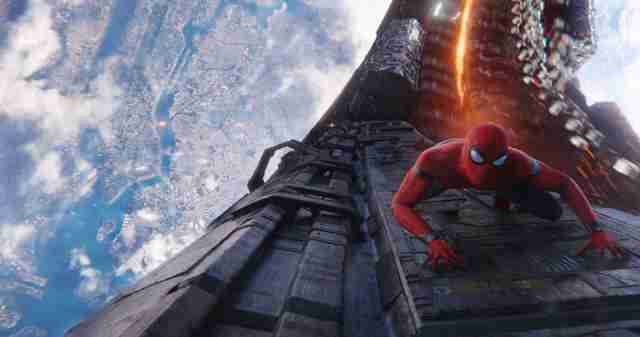 There's enough Peter Parker and Tony Stark story in Captain America: Civil War and Homecoming to make Peter’s flaky death in Infinity War a heartbreaking moment, but all of that character development is in two other not-Avengers movies. The Avengers movies are the core book, the movies in the series that suffer the most when viewed in isolation. Marvel leans into that paradigm with Avengers: Infinity War by accepting that super-fans of the MCU will be aware of the meta-narrative of the film: Chris Evans, Chris Hemsworth, and Robert Downey, Jr. are all at the end of their contracts after one more Avengers movie, yet are left alive at the end of Infinity War. Black Panther, Spider-Man, Doctor Strange, and the majority of the Guardians of the Galaxy have disappeared, yet all have sequels in the planning stages. This is only Part 3 of a four-part film. Although Infinity War is only loosely based on the Jim Starlin-written 1991 Marvel Crossover event Infinity Gauntlet, there are lingering similarities and references from the comic that show up in the film. Instead of Bruce Banner falling into Doctor Strange’s New York Sanctum at the beginning, it’s The Silver Surfer in the comics, but the warning that Thanos is coming and the primer on the Infinity Stones is very similar. 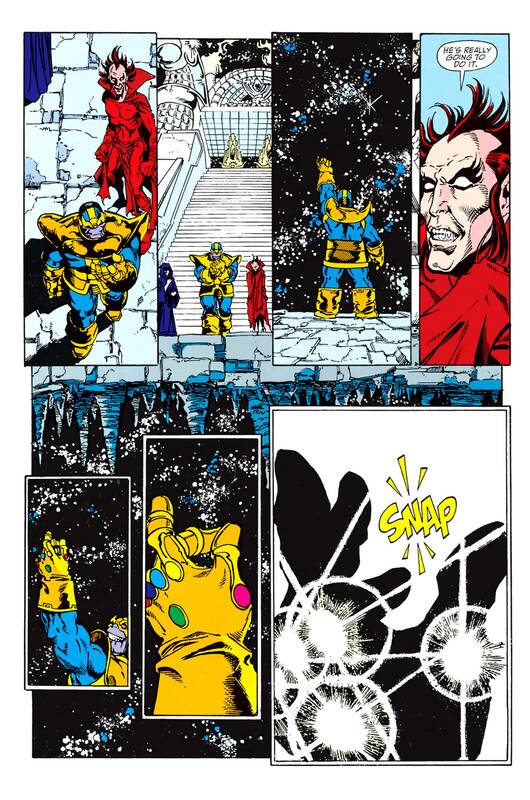 Also, at the end of Infinity Gauntlet #1, Thanos snaps his fingers and kills half the universe. That's right: Thanos snaps his fingers at the end of the first issue! The majority of the team-up of recognizable heroes happens afterwards. In Infinity War, it’s no coincidence that the original Avengers are among the surviving half of all life; that raises the stakes for all of them for the final chapter. What was that logo on the pager-thing in the end-credits scene? Samuel L. Jackson’s Nick Fury and Cobie Smulders' Maria Hill both make cameo appearances after the lengthy credits, and before Sam Jackson can utter an almost trademark curse, he flakes into nothing and drops something that looks like a pager on the ground. The camera pushes in on it as a logo comes on the screen: the Captain Marvel logo! Captain Marvel is one of two movies that Marvel will be releasing between now and Avengers 4, coming out in February 2019, and we know from the official production announcement for the movie that it's set in the 1990s. Whatever happens at the end of that movie, it appears it won’t include Brie Larson's Carol Danvers coming back to Earth. The space-pager we see in the post credits scene does look like it could be modified 1990s tech. Not to spoil Captain Marvel, but her powers are cosmically based. The original comic book Captain Marvel was Mar’vell of the Kree Empire -- Kree, like Ronan the Accuser (Lee Pace), who died in Guardians of the Galaxy but will return in Captain Marvel thanks to the movie's '90s setting. Captain Marvel, the movie, will also introduce the shape-shifting alien race The Skrulls into the MCU retroactively. Surely, a shapeshifting alien race having been aware of Earth for two decades hasn’t had any future consequences! In the Infinity Gauntlet comics, the remaining heroes are gathered together by Doctor Strange and Adam Warlock, a character who lived inside the Soul Stone (long story, and it’s not important since we’ve seen Adam Warlock’s birthing pod in one of Guardians of the Galaxy: Vol. 2's many post-credits scenes). It’s possible that Captain Marvel plays a similar role coming to Earth (or helpfully getting Tony Stark and Nebula back to Earth) to join the more well-known Avengers. 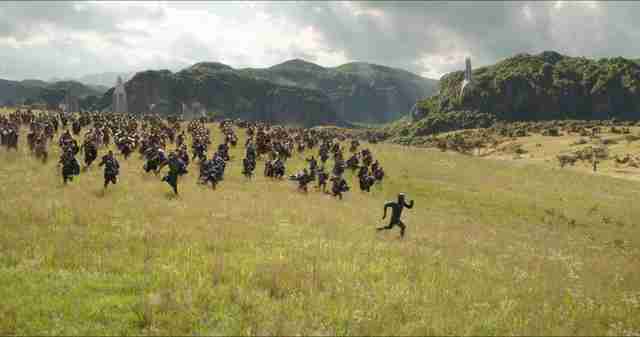 Where are Hawkeye and Ant-Man? In the movie we get a throwaway explanation that they got house-arrest deals to spend time with their families. Then again, if they were willing to come out of hiding to help Captain America, why would they be MIA when the fate of the planet is at stake? In the post-credits scene, Nick Fury is about to contact "Clint" before the car crash interrupts him, so it's possible that Hawkeye is off doing something important besides protecting his family. We just won’t know about it until Avengers 4. We know from leaked set photos that Hawkeye will have a new mohawk hairstyle that many are suggesting is his Ronan costume from the comics (Ronan being Hawkeye’s vigilante name, like how Captain America is called "Nomad" when he’s not repping the USA). When we catch up with Hawkeye next year, he’ll be at least partially active in keeping the world together. Scott Lang (Paul Rudd) has his own sequel movie, Ant-Man and the Wasp, coming out in July, which will explain why Scott and Hope (Evangeline Lilly) didn’t make it to Wakanda. We know the July film will introduce Michelle Pfeiffer to the MCU as Janet Van Dyne, who's been trapped in the Quantum Realm, and we know the rules of space and time don’t always apply there like they do in the normal-sized world. Is it possible Wasp and Ant-Man were just in the Quantum Realm while the main Thanos assault was happening? What is Avengers 4 about? That’s the real question posed by the very existence of Infinity War: Now what? Surely half of our most profitable heroes didn’t really dissolve into nothing. In the Infinity Gauntlet comic books, before Adam Warlock can set everything right in the universe, Nebula manages to steal the Gauntlet from Thanos and pulls back events by 24 hours. It’s a bit of a cheap move plot-wise -- "just undo everything" -- but it worked on the cosmic scale of the Infinity Gauntlet story. In the Marvel Cinematic Universe, the only way to reset Gauntlet shenanigans would be to possess the Gauntlet and use it against Thanos. Because of the specific wording of the Infinity War showdown between Thanos and Tony Stark, it seems likely that Tony could make a play for the Gauntlet when they locate Thanos’ vacation home. However, Avengers: Age of Ultron showed that Captain America was almost worthy enough to lift Thor’s Hammer, so Cap wearing the Infinity Gauntlet to save the universe is also a possibility. Which makes sense, as those two characters are the backbone of the Avengers story. 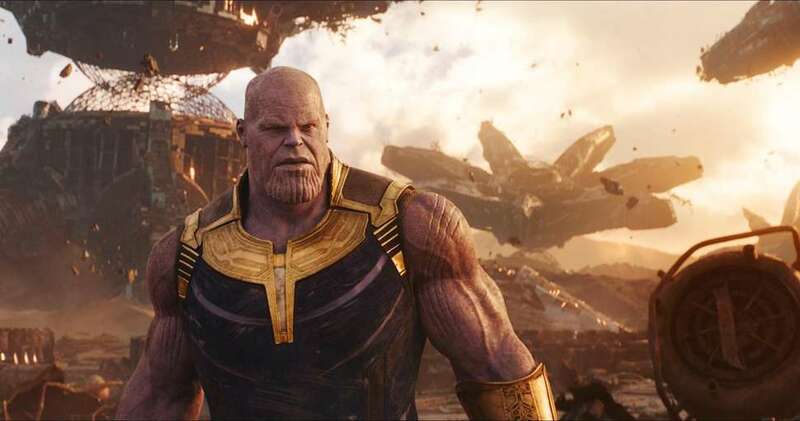 Complicating factors have already been established in Infinity War: 1) Doctor Strange implies that Tony had to live and Thanos had to get the time stone in order for the Avengers to actually "win" in that one-in-multiple-millions future scenario. As far as we know, we’re on that winning path, and Tony Stark's survival is the crux of the plan, 2) the Soul Stone requires the sacrifice of someone you love before you can wield it. Tony’s got marriage plans, and Cap’s the self-sacrificing type, so that whole issue could lead to a Civil War redux. Even if Avengers 4 takes the comic book way out and has an Avenger wish the entire universe into the past, it probably still leaves The Asgardians, Heimdall, Loki, and Gamora as permanently dead, and chances are good that Vision would need to be actually separated from the Infinity Stone, like Shuri attempts to do in Infinity War, in order for him to survive. But ultimately, everyone who flaked away is coming back... in a little over a year. Sebastian Stan gave an interview where he cited being in a scene with both Hank Pym (Michael Douglas) and Janet Van Dyne (Michelle Phieffer), and that did not happen in Infinity War, basically confirming that The Winter Soldier meets up with the original Ant-Man and Wasp. That means they’re all somewhere, even if "somewhere" is a Quantum Realm or an alternate timeline. What is Avengers 4 going to be called? After Zoe Saldana’s comments, James Gunn was quick to come out and suggest Saladana just misspoke when she said the Guardians cast was coming back for "[Infinity] Gauntlet," but that title still makes a lot of sense having seen Avengers 3. The Infinity Gauntlet is the new macro-MacGuffin, holding all the previous MCU MacGuffins in one golden glove built by Peter Dinklage. Not only that, but "Gauntlet" has a second meaning: "go through an intimidating or dangerous crowd, place, or experience in order to reach a goal." A gauntlet for the Gauntlet: coming 2019. Dave Gonzales is a pop-culture writer and podcaster who wields the internet's version of the Infinity Gauntlet. Follow him @da7e.